MANY NEW MENUS FOR 2015! provide knowledge and instruction on specific subjects. and supervised, in a safe environment, by instructors who like kids. MON, JUNE 1 - FRI, JUNE 5 3 DAY SALE! SAVE $26 NOW! 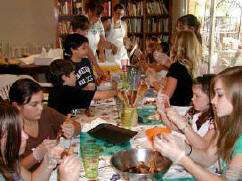 Our kid's cooking camps include full meals each day. different regions always made with fresh ingredients. and have a heckuva lotta kid fun! our emphasis is on fun! on the link to that page above.